An average of 50% of all small businesses never reopen their doors after facing a water or fire disaster. Yet, many small businesses don’t have an emergency response plan in place to minimize the impact of a such a disaster. SERVPRO® of Johnston County can create a completely free of cost Emergency Ready Profile for any business, large or small. 1) You’ll have an immediate plan of action at your fingertips. The SERVPRO®Emergency Ready Profile will be available to you as both hard copy and digitally, so that you have access to important emergency information about your building. Whether you own or rent your space having an SERVPRO® Emergency Ready Profile will save you time, money and headache should a disaster occur. 2) You’ll know where to find the utility shut-offs. Depending on the size and nature of a disaster, it might be imperative that somebody immediately shut off the gas, water, and/or electricity. During the SERVPRO® Emergency Ready Profileappointment we will tag and photograph each shut-off valve location. The profile will also note anything special about their locations. 3) You’ll have access to all your information in one place. Your SERVPRO® Emergency Ready Profile will contain: a) all the numbers you’ll need for utilities, insurance and local authorities. b) The age of your building as well as materials used.c) Parking information for emergency services. If you’ve never thought about creating an Emergency Ready Profile now is the time to start. Because disaster rarely offers a warning, you don’t want to be caught off-guard when it strikes. Call Your SERVPRO® of Johnston County to get your personalized Emergency Ready Profile today! 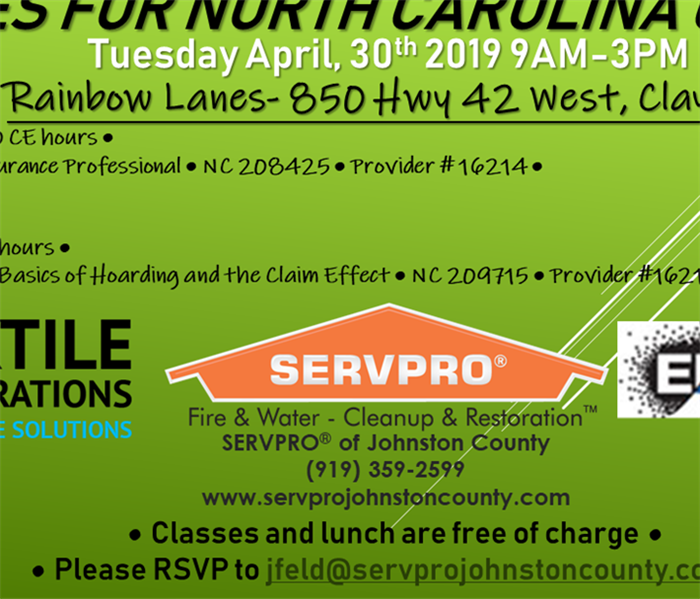 On April 30th 2019 SERVPRO® of Johnston County will host two CE Classes for insurance professionals. Ethics will begin at 9a.m. sharp. Come a little early to get some coffee and breakfast and network with other professionals. Hoarding will begin at 1p.m and end at 3p.m. These CE Classes will be held at the Rainbow Lanes in Clayton NC. Classes are free to attend and a light breakfast and full buffet lunch will be served, also free of charge*. Please RSVP to jfeld@SERVPROjohnstoncounty.com by April 28th. Feel free to invite other insurance professionals! *If you are required by your carrier to pay for CE Classes the cost will be $10 cash. We will provide receipts. Disaster often strikes at the most inconvenient time. I have yet to speak with a homeowner that was completely prepared to deal with the aftermath of storm, water, fire or mold damage. Even with superior insurance coverage you may have to cover a deductible. And you may or may not have the emergency funds to cover that deductible. Or, perhaps, since your home is already torn up, now would be the perfect time to upgrade to those finishes you’ve been dreaming of but the insurance only allows the funding to replace what you had before and you just don’t have enough stashed away right now. We can now offer an avenue for you to finance the repairs and restoration for your home. 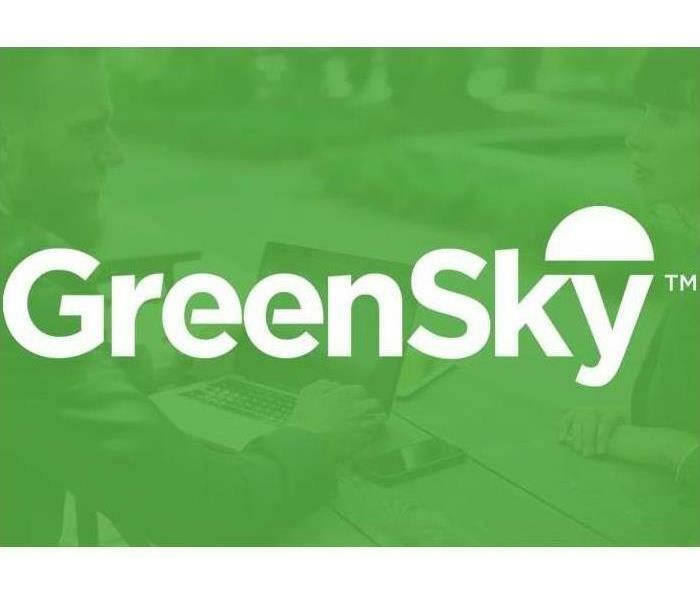 Go to www.greensky.com/consumer to learn more! 2018 was the wettest year on record for North Carolina, with an astounding 59.2” of rain as of December 28th. All that rain brought in loads of wet crawlspace, leaky roofs and mold calls for us here at SERVPRO of Johnston County. Yet the rain just keeps on falling. 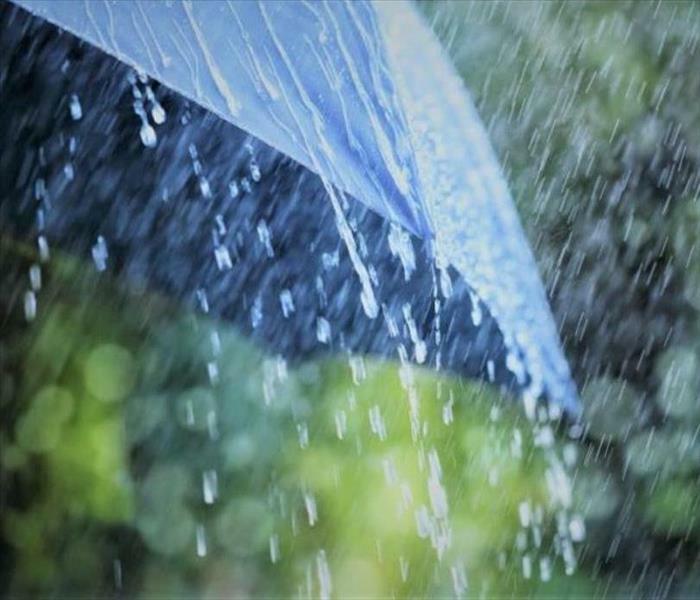 Since January 1st 2019 we have already seen 7.41” of rainfall (and it’s raining again today!). As you can imagine the calls for wet crawlspaces, leaky roofs and mold just keep pouring in. Protect your home and the health of your family by checking to make sure your crawlspace is dry. A wet crawlspace can lead to a moldy crawlspace. Mold in your crawlspace can affect the air quality in your home. Make sure your gutter downspouts are moving the water away from your foundation. The use of a downspout diverter or splash block can be very inexpensive way to move the water away from your foundation. Open all the wall vents to increase airflow. If you have a vapor barrier in place, mop up any standing water and check for holes or tears. If you’ve already taken steps to dry out a wet crawlspace and it isn’t drying after a few days, without further water intrusion, call us in. We have the equipment and expertise to dry it out and keep your home safe and dry. Here at SERVPRO of Johnston County we see all sorts of water damage caused by all kinds of plumbing disasters. Whether the damage is caused by mechanical failure, human error, storms or accidents we are equipped to deal with them all. However, some are preventable. Today we focus on a preventable disaster that starts in the kitchen. Greasy clogged pipes! YUCK! Never pour any type of fat or grease such as butter, cooking oil, ice cream, gravy, or bacon fat into your pipes or toilets. Not only to save our local sewage pipes and water treatment plants but to save you big bucks on repair costs to your home. Nobody wants raw sewage to back up into your house or yard and cost you big money for the cleanups and plumbing repairs! *Do NOT pour grease down the sink or toilet! *Do NOT use hot water to rinse fat, oil, or grease off pots/pans/plates! Even degreasing soap & hot water cannot eliminate fats, oils or grease. Sure it melts into an easy to remove liquid, but then, it re-forms in the pipes as a hard gunky mess. 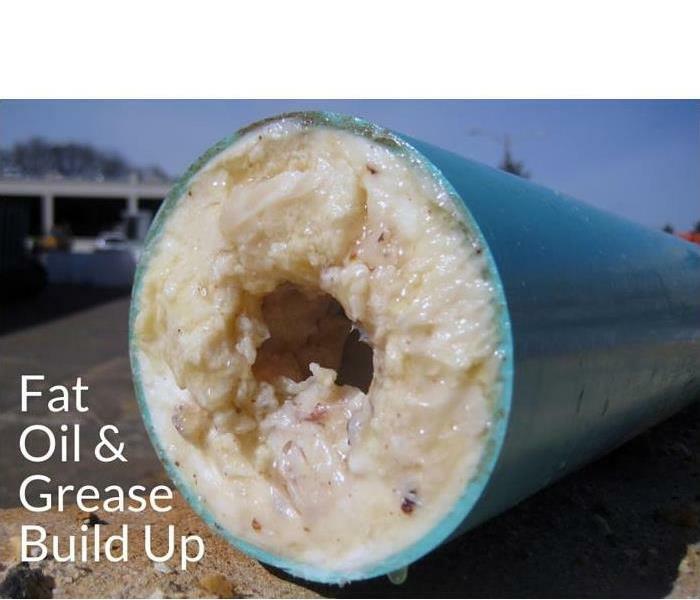 Over time this can build up and completely clog your pipes. Scrape ALL food scraps in the trash or catch them with a sink strainer. Wipe greasy dishes with dry paper towels before rinsing or washing. Pour hot fat, oil, or grease into a can or container. Allow to cool or harden then toss it in the regular trash. If your drains are running slowly and you think there may be a greasy clog it's best to call in a professional to remove the clog before damages occur. If you need help finding a trusted professional give us a call. Insurance Agents - Get Your CE's with SERVPRO! SERVPRO of Johnston County is proud to host two CE courses for North Carolina Insurance Professionals on August 14, 2018! Come attend "Ethics to Work by for Insurance Professionals," and "Don't Be Taken to the Cleaners" and earn 5 Continuing Education hours. No cost to you; however, if company guidelines require you to pay, each class is $15. Lunch will be provided. Happy Independence day from our team to you! While you enjoy cookouts and family fun, please keep in mind fire and water safety. Especially with grills, fryers, sparkers and fire crackers. Keep these items at least three-feet from the wall of the house and out of the grass to prevent fire. We are so grateful to celebrate another year here, thanks to our community and you! Happy Fathers Day! Golf and Grill! Happy Fathers Day to all the great folks our children call Dad! This weekend is full of golf and fun for the guys here at SERVPRO, a well-deserved break from the storms that have kept us engaged within the community and helping others. They are playing in the 10th Annual Captains Choice Golf Tournament in Garner, hosted by the Greater Cleveland Chamber of Commerce. Are you grilling this weekend? Some family favorites here are burgers, dogs, BBQ, and corn on the cob! How about some fresh local produce from farmers out here in Clayton, Garner, Smithfield, Selma, and Raleigh? I've enjoyed fresh strawberries from a farmer in Archer Lodge, some watermelon and cantaloupe from others in the area. What a bounty our Spring has given us! Enjoy this coming weekend and the beautiful weather that is promised and stay safe! Top photo, before drying process. Bottom photo, after drying process. Water damage to a home or business can be devastating. The quicker we can get in to take care of the issue, the better and less likely we’ll have to come in and demo. That isn’t always the most ideal option for business and home owners and can draw out the repair process. The photos of the hardwood floors attached to this blog are a perfect example of that. The homeowner called about a burst pipe on the second floor during extremely cold temperatures. Water was beginning to stand on the floor as a result. Beautiful hardwoods on the entire first floor of the home were affected. The first photo shows the floors beginning to cup from the standing water. Once we came in and extracted the water and dried the floors, tenting the floor with plastic became a focus to dry the hardwoods in order to salvage them. They then used a desiccant dehumidifier and wood floor drying units to slowly dry the floors. Slow drying prevents us from over drying the hardwoods or drying too fast. 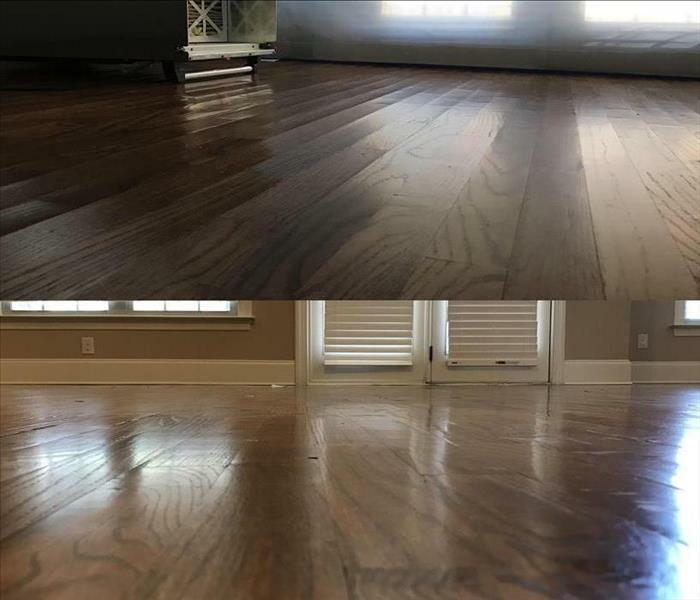 Once drying is complete, the hardwoods need to acclimate at least 30 days before they can be refinished to bring the back to their original state. The second photo is after the drying process. The hardwoods are already looking excellent and on their way back to their original state. 2/27/2019 - Who prayed for rain? 2/26/2019 - Greasy clogged drains. Ewwww. 7/16/2018 - Insurance Agents - Get Your CE's with SERVPRO! 6/28/2018 - Happy Independence Day! 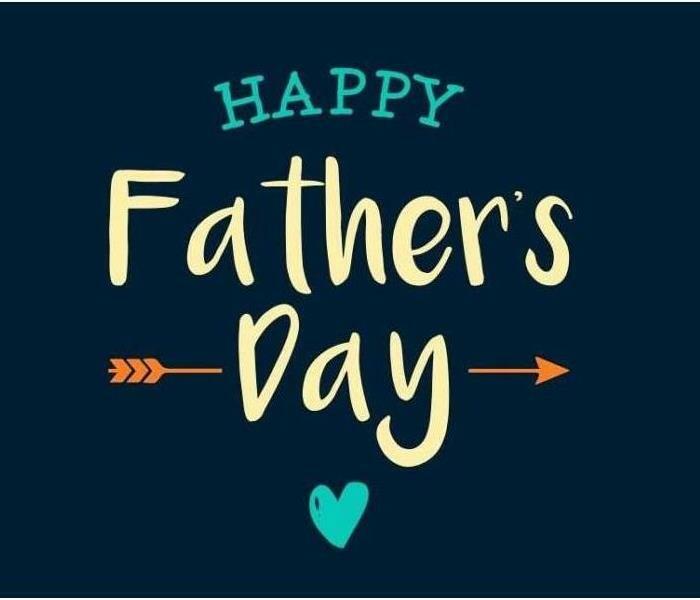 6/12/2018 - Happy Fathers Day! Golf and Grill!